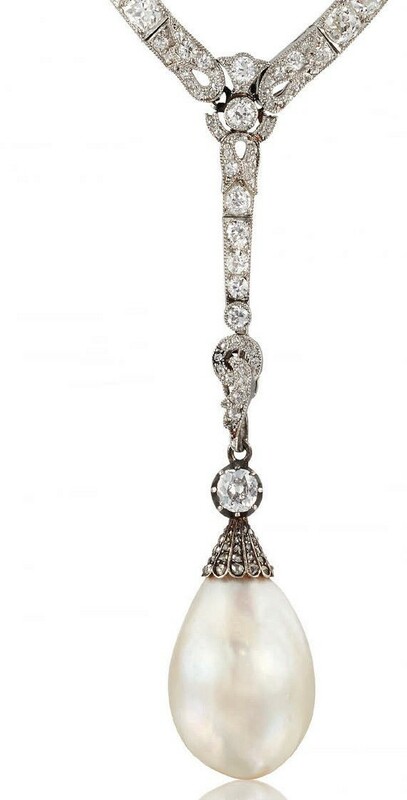 A 200-year-old saltwater pearl, later mounted in a Belle Epoque necklace, has sold at a hammer price of £150,000 at Roseberys in West Norwood (plus 25% buyer’s premium) to a London phone bidder. Saltwater pearl estimated at £70,000-100,000 in Roseberys’ London auction on November 20. The exact history of the pearl is not known but it was mounted in the late 19th century and then set in a diamond and platinum Belle Epoque necklace c.1915. Featuring on the front page of ATG (No: 2367), it carried an estimate of £70,000-100,000 due to it being a “exceptional pearl”. Any saltwater pearl of more than 100 grains is regarded as special. A recent report from Gemmological Certification Services, GCS, London, states that this pearl is natural, of unusual symmetrical shape, has an intense lustre and weighs 128 grains. It may have taken as long as 10 years to grow in the warm waters of the Arabian Gulf, the coast of northern Australia or the Panama waters of Venezuela, probably sometime in the 18th century.